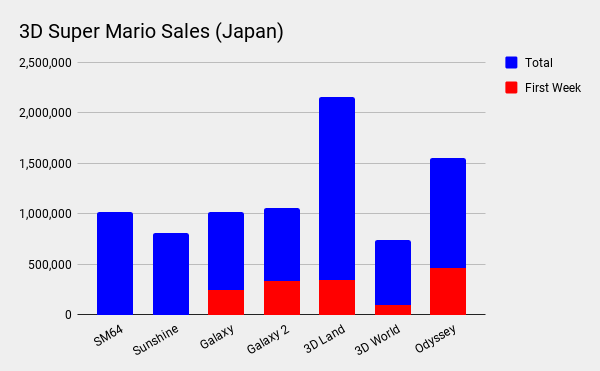 At over 1.5 million units sold in three months, Super Mario Odyssey has outsold every 3D Mario game in Japan, save for Super Mario 3D Land on the Nintendo 3DS. This is particularly significant because Nintendo believed for a long time that the Japanese videogame audience was not as comfortable with 3D Mario games as they were 2D ones. For example; Super Mario Galaxy has been very successful, with 8.84 million units sold worldwide as of March 2010. However, if you divide those sales up by region, Japan only accounts for 1.01 million units, while the overseas markets account for the remaining 7.83 million. New Super Mario Bros. Wii, on the other hand, has sold over 3.6 million units in Japan. In 2010, late Nintendo president Satoru Iwata explained why this was the case. “As we see it, one reason why a number of people who love 2D Mario do not want to play 3D Mario appears to be because they are afraid to be lost in the 3D world by not knowing the exact directions, while they feel that they can play with 2D Mario with no such issues,” Iwata had said to investors. 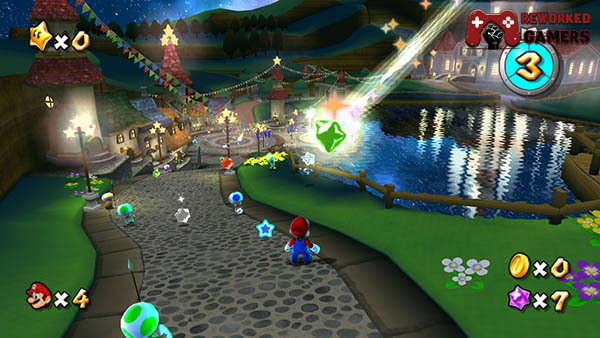 One of the goals of Super Mario Galaxy had been to create a 3D world where it was easier for the player to find their way around. This had been attempted with the use of spherical worlds, which would ensure that you would always manage to find your way back to where you were. Another issue is that motion sickness whilst playing games is fairly common in Japan. To combat this, Takao Shimizu, producer of Super Mario Galaxy—who suffered from motion-sickness himself—personally playtested the game frequently, advising the team on how to manage camera angles in a way that wouldn't make a user susceptible to motion-sickness feel queasy. Unfortunately, neither Super Mario Galaxy nor Super Mario Galaxy 2 managed to overcome these two obstacles entirely, and topped out around the 1 million mark in Japan. “However, when we look at the Japanese sales, I do not think that we were able to effectively tackle this challenge with the original,” Iwata had stated. 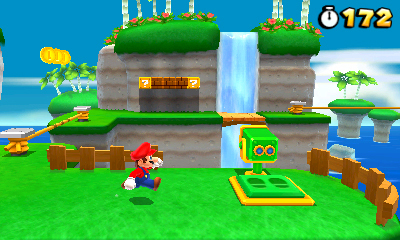 In 2011, Nintendo attempted to solve the "afraid of getting lost" problem again, with Super Mario 3D Land for the Nintendo 3DS. 3D Land was designed to be a game that featured 3D movement within the confines of stages that were linear and only featured a single path from beginning to end. 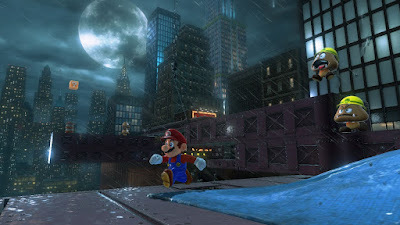 This way, Nintendo felt, they could combine the fun of 3D Mario's movement with the straightforward level design of the 2D Mario games. The experiment was a success, and Super Mario 3D Land went on to sell well over 2 million units in Japan. Nintendo had finally figured out how to create a 3D Mario game that Japanese players were comfortable playing. They went on to use a similar structure for Super Mario 3D World on the Wii U. This game wasn't as successful, due to the fact that the Wii U itself wasn't a popular console. This is what makes Super Mario Odyssey so interesting. Not only is it a 3D Mario game, it's the most exploratory and open-ended a 3D Mario game has been in years. From the "afraid of getting lost" perspective, Odyssey is the sort of game that should be very intimidating to the casual Mario fan in Japan. And yet, it isn't. Instead, it's doing incredibly well. Three months since its release, the game has sold 1,555,312 units in Japan, outselling Super Mario 64, Super Mario Galaxy, and Super Mario Galaxy 2. 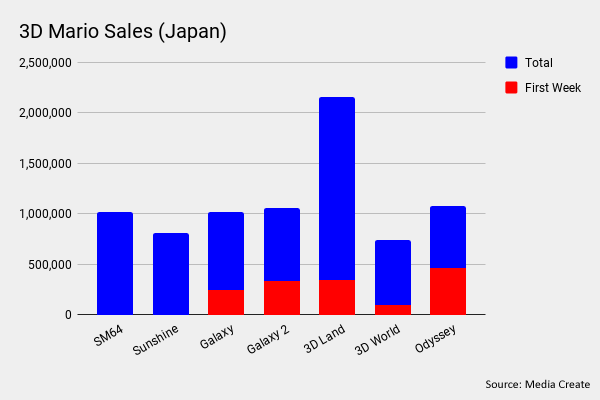 In summary, it has managed to outsell every 3D Mario game in Japan, save for Super Mario 3D Land. Why is this happening? Partly because the Nintendo Switch itself is such a popular platform, and the excitement for the device itself is generating excitement for its software. But there's another reason, too. The Switch is a portable platform, and portable game devices are Japan's primary way of interacting with videogames. 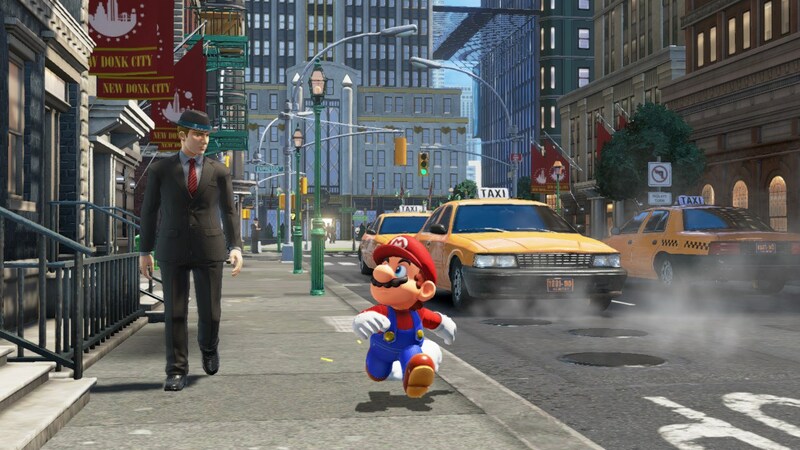 They offer a convenience that the Japanese value immensely, and I believe the Nintendo Switch—by proxy of being a portable—is allowing the more casual Mario fan to take a gamble on Super Mario Odyssey to see if they like it. 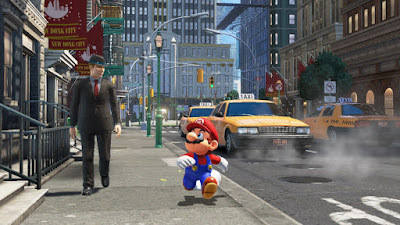 Update - Jan 29th, 2017: The information above was updated to include the latest available sales figures for Super Mario Odyssey three months after its release. Sales data courtesy of Japanese sales tracker Media Create.